C. F. Martin 00-21 Model Flat Top Acoustic Guitar (1931), made in Nazareth, PA, serial # 45416, natural finish, Brazilian rosewood back and sides, spruce top; mahogany neck with ebony fingerboard, period black hard shell case. The 12-fret, steel string Martins of the late 1920s and very early 1930s are some of our very favorite guitars. For only a few years right at that time -- just before Martin altered nearly all their designs to the 14-fret neck "Orchestra Model" pattern -- the company crafted a relatively small number of Brazilian rosewood-bodied flat-tops braced for steel strings instead of the gut used previously. 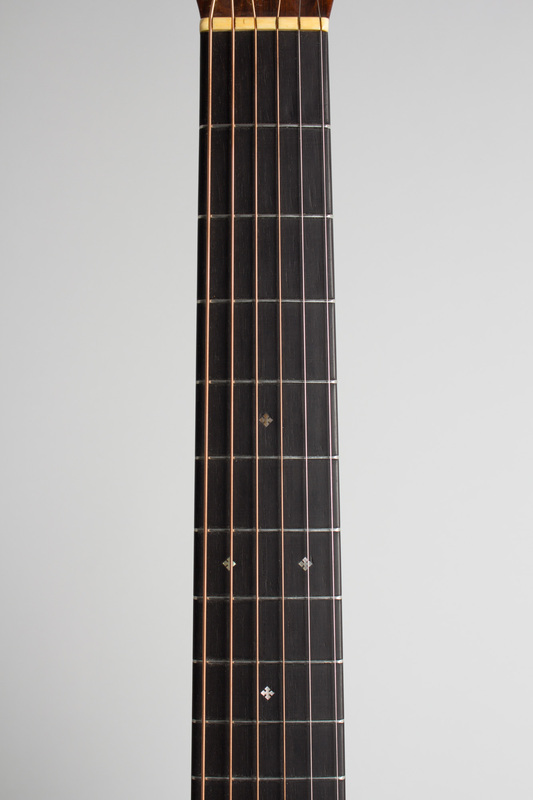 The other features are pretty much as they had been since the last century, with a wide fingerboard on the neck which joins the body at the 12th fret. These guitars were the final evolution of the original 19th century Martin patterns before the "modern" 14-fret design became the standard just a few years later. 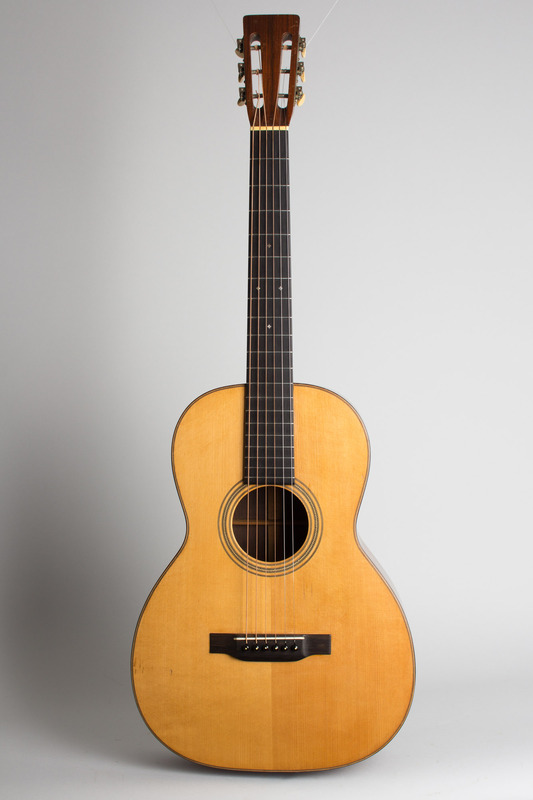 This early 1931 guitar has the then-new larger "belly" bridge, but no pickguard yet -- a short-lived transitional combination. 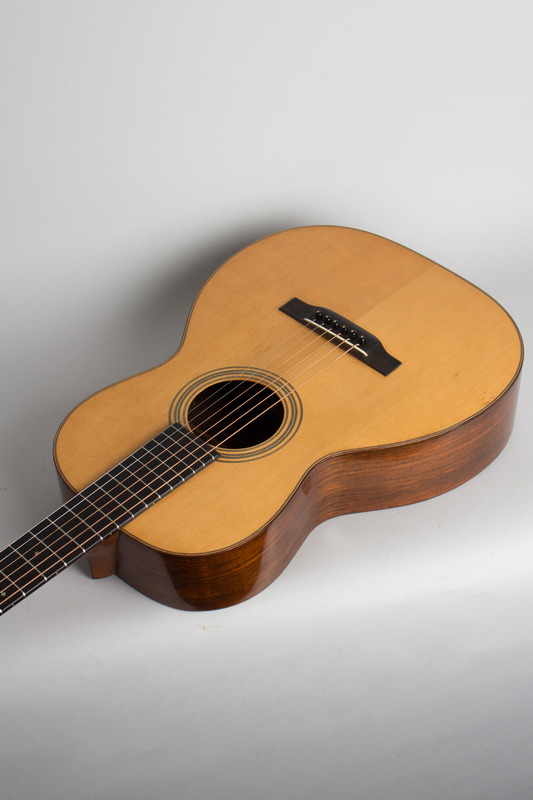 The Style 21 designation signifies a midline instrument, the 00-21 being the second smallest and lowest-priced rosewood model in the company's line, over the smaller 0-21. Models beneath this were built with mahogany back and sides instead of the even-at-the-time costly rosewood. It is still built to the same quality workmanship standards as the highest-grade instruments. The superb figured Brazilian rosewood on the back has an interesting light strip bookmatched to straddle the herringbone backstrip. 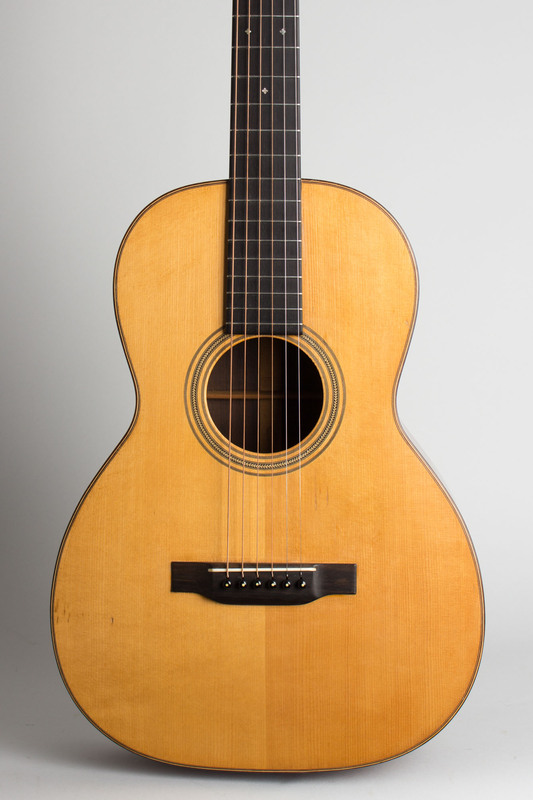 This would be considered a premium look today, but Martin considered this "flawed" at the time and so used the pieces on a Style 21 instead of a higher grade guitar. The famous Martin "herringbone" trim also ornaments the sound hole ring instead of around the top edge as with a Style 28; the outer binding is rosewood and the ornamental position markers in the ebony fingerboard small slotted diamonds. This 00-21 was built very early in 1931 and is one of just 110 shipped that year, priced at $60.00, which seems like an incredible bargain even calculated in period money. Although produced in the larger quantity than some of the highest grade models, this is still a very rare guitar today. 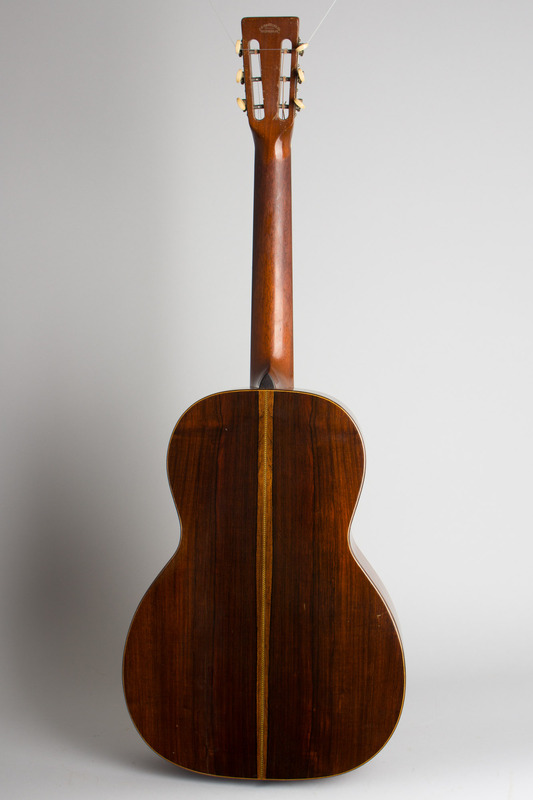 Early 1930s Brazilian rosewood Martins were made in very small numbers by later standards, and if the original price seems laughable today they were still some of the most expensive flat-top guitars of the early Depression era. This one has had some finish added but has not seen nearly as much abuse as many, and remains in far better preserved and more original condition than most period survivors. It is also simply a wonderful playing and sounding instrument, a testament to its builder's skill and reputation and at least as fine a 12-fret 00-sized model as anyone has ever made -- then or since. Overall length is 38 in. (96.5 cm. ), 14 1/8 in. (35.9 cm.) wide at lower bout, and 4 1/16 in. (10.3 cm.) in depth at side, taken at the end block. Scale length is 24 3/4 in. (629 mm.). Width of nut is 1 7/8 in. (48 mm.). This guitar is in very good condition for its age, with some repairs performed but less wear than many. 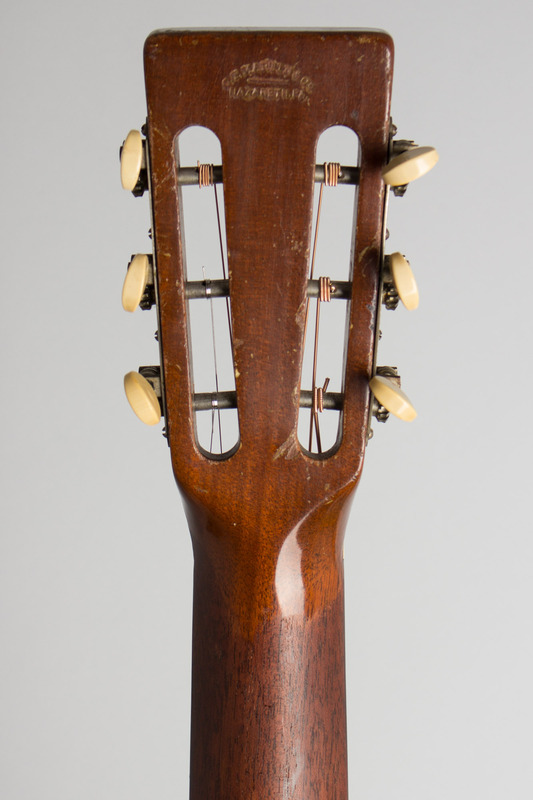 The top, back, and sides have an old clear overspray, which is fairly common on guitars of this period that were repaired 50 or more years ago. At the time repair people would often add a fresh finish so the instrument looked "new" again, which when these were just "used guitars" is what many users wanted. This added finish is a fairly thin, smooth semi-gloss clearcoat, not as thick as many we have often seen but does give the body a smoother patina and slightly less ambered color than it might otherwise have. 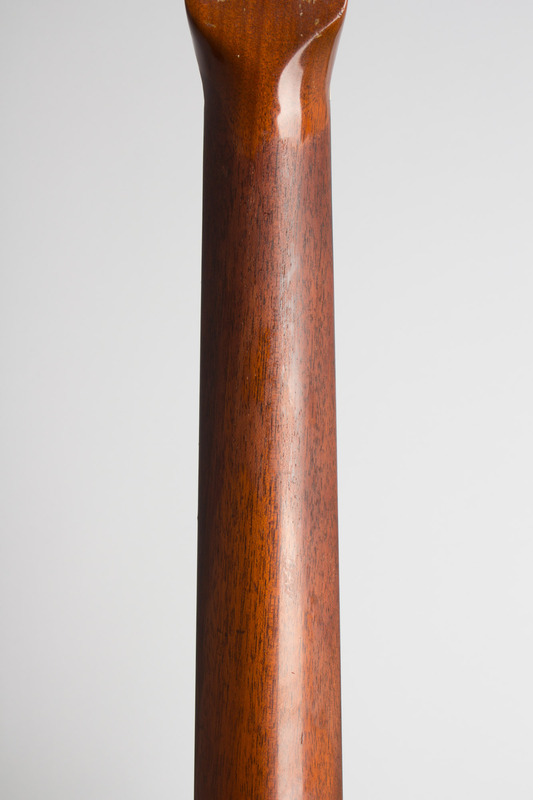 The neck finish remains original, with some wear down to the wood on the back. Otherwise the instrument is quite well-preserved. It has some light pickwear through the finish below the sound hole rim; some over and some under the second coat of lacquer. The rest of the finish has some small dings and scrapes, but no large areas of damage. 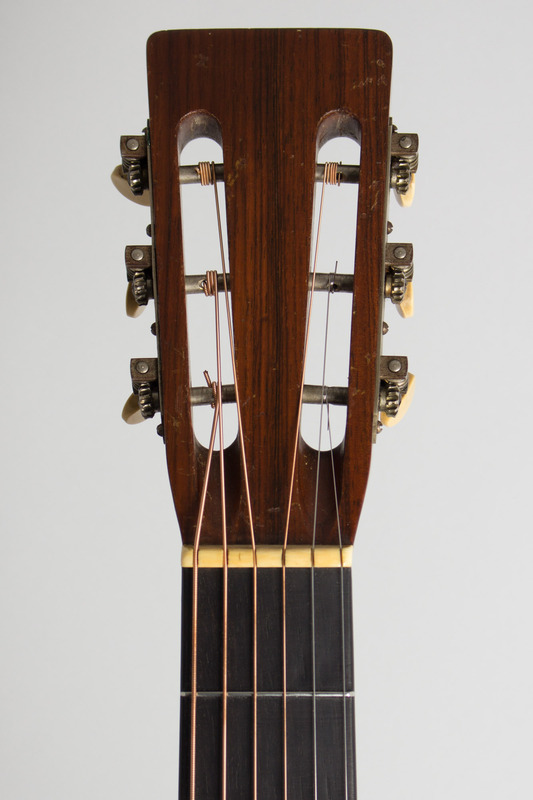 The ebony belly bridge appears to have been lowered somewhat, more so on the treble side but still retains a good height. The guitar has most likely had a cleanly executed neck reset sometime in the past. Everything apart from the added finish on the guitar appears original including the openback Waverly strip tuners, beautifully scalloped braces and the very thin maple bridgeplate. 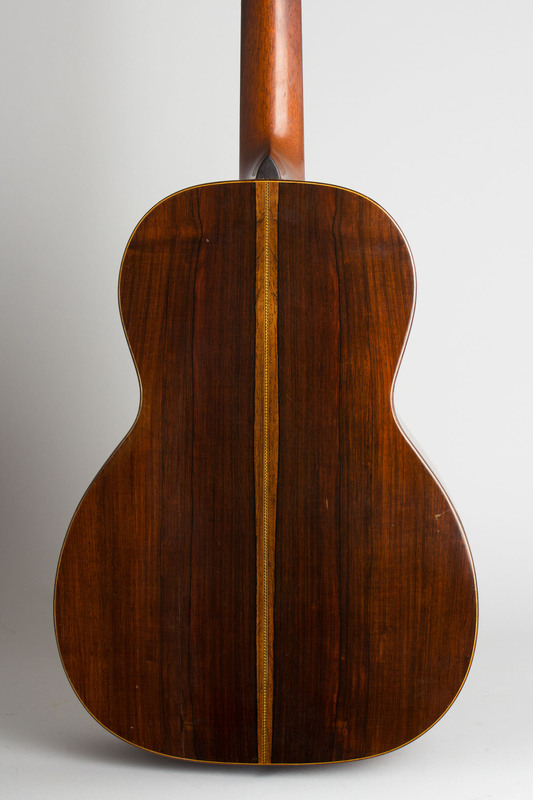 There is one long grain crack to the rosewood on the treble side from the waist back, well-sealed but visible. The back has another grain split about 3" below off the center seam, which itself has a few small open spots. All are solidly sealed up, and the top is remarkably crack free. We rarely see these early 12-fret steel-string Martins as well-preserved as this, even considering the additional finish work. The original bar frets have been taken down a bit but playability remains excellent. This 00 is a big-sounding guitar for a small-body instrument, with power and articulation in perfect measure in both finger- and flat picked modes. Includes a very finely preserved period hardshell case that is just a bit long for the guitar but may well be original in still functional condition. Excellent - Condition.